I love using this everyday . I sure love that I was able to buy this at a fraction of the cost my daughter got hers for from Kirby. Overstock.com has really good items even the ones that are refurbished . We have had the vacuum less than a month and there is a short in the foot switch and the unit will not power up. 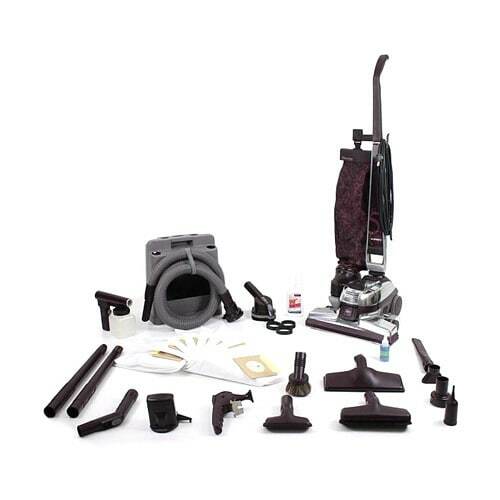 There is a warranty however, we have to pay for shipping to and from the repair shop and it costs more for shipping costs than to have the vacuum repaired locally. Best vacuum ever made. NOT a piece of plastic junk. No other sweeper comes close, EVER. Kirby is the ONLY sweeper I ever bought. I don't waste my money buying junk that lasts a year and then you have to buy another. This sweeper will last over 30 years, just like my G2, G3, and my last G4 I purchased in 1994. I only upgrade for a nice model. All my previous Kirby sweepers are still functional, work great, and I usually sell them to pay for a new, shiny model. "Does this G5 have the tech drive power assist?" "I had a Kirby G5 years ago and loved it, my Kirby also came with a shampooer, but I don't see it listed here." "How old is this vacuum? What attachments does it have? Does it have shampooer? Has it been refurbished? Warranty?" Hello Temica T., this model was made between 1997 and 199. It will come with the genuine Kirby 14 piece tool kit, as well as the Kirby Zipp brush. It will not come with the carpet shampooer, but it will have a hand held shampooer , which would be used for spot treating carpet and upholstery. Thank you for shopping with us! This vacuum has been refurbished. There is a 5 year warranty on this product through the company who refurbished it.